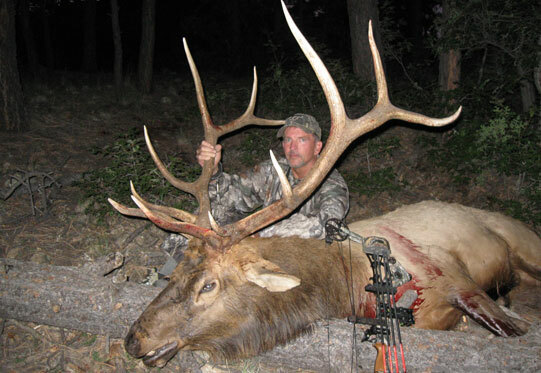 Few things are more exciting than elk hunting for a big game trophy. Not only does it provide a distinct adrenaline rush; it also provides successful hunters with a unique story that they can brag about for years to come. Big Horn Outfitters has built our reputation by taking our clients out on thrilling, adventurous, and most importantly, successful guided hunt in New Mexico. Our guests have the opportunity to bag a variety of exceptional trophies, including elk, antelope, black bears and mule deer hunting. An experienced and knowledgeable hunting guide will help lead the way, and we provide guests with lodging accommodations, three home cooked meals a day and take care of the tags and/or voucher protocols. Hunters are also able to enjoy a scenic hunting setting in the middle of the Gila and Apache Forest. We take our clients on both private and public land, and embark on a thorough scouting process before our guests arrive. Additionally, our business can help you with post-hunt tasks, such as meat processing and shipping to the address of your choice. Regardless of your specific needs, we will work diligently to ensure you have a memorable and successful hunting trip with Big Horn Outfitters. To insure that a satisfying hunting experience can be realized by our clients, within our capability, we are willing to make special arrangements to accommodate most situations. Bighorn Outfitters LLC is operating under a special use permit with the USDA Forest Service on the Gila National Forest. Thank you for visiting our website and for your interest in a guided hunt with Bighorn Outfitters. Please call us with any questions.